St George’s Day on 23 April will see the launch of the next generation of Royal Mail definitive stamps, which for the first time will not feature the Queen’s head. 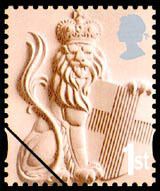 The standard first-class stamp features the crowned lion of England, a medieval icon for courage, strength and nobility, while the second class shows the three lions of England, an emblem that dates back to King Richard I, but is more commonly associated with the national football team’s strip. The stamps have been designed by Sedley Place.